PART I: SCOPE AND BACKGROUND MATERIAL. 1. Environmetrics, Science and Decision Making. 2. Basic Statistical Concepts. PART II: LINEAR NONSEASONAL MODELS. 3. Stationary Nonseasonal Models. 4. Nonstationary Nonseasonal Models. PART III: MODEL CONSTRUCTION. 5. Model Identification. 6. Parameter Estimation. 7. Diagnostic Checking. PART IV: FORECASTING AND SIMULATION. 8. Forecasting with Nonseasonal Models. 9. Simulating with Nonseasonal Models. PART V: LONG MEMORY MODELLING. 10. The Hurst Phenomenon and Fractional Gaussian Noise. 11. Fractional Autoregressive-Moving Average Models. PART VI: SEASONAL MODELS. 12. Seasonal Autoregressive Integrated Moving Average Models. 13. Deseasonalized Models. 14. Periodic Models. 15. Forecasting with Seasonal Models. PART VII: MULTIPLE INPUT-SINGLE OUTPUT MODELS. 16. Causality. 17. Constructing Transfer Function-Noise Models. 18. Forecasting with Transfer Function-Noise Models. PART VIII: INTERVENTION ANALYSIS. 19. Building Intervention Models. PART IX: MULTIPLE INPUT-MULTIPLE OUTPUT MODELS. 20. General Multivariate Autoregressive Moving Average Models. 21. Contemporaneous Autoregressive-Moving Average Models. PART X: HANDLING MESSY ENVIRONMENTAL DATA. 22. Exploratory Data Analysis and Intervention Modelling in Confirmatory Data Analysis. 23. Nonparametric Tests for Trend Detection. 24. Regression Analysis and Trend Assessment. Data Appendix. Author Index. Subject Index. This is a comprehensive presentation of the theory and practice of time series modelling of environmental systems. A variety of time series models are explained and illustrated, including ARMA (autoregressive-moving average), nonstationary, long memory, three families of seasonal, multiple input-single output, intervention and multivariate ARMA models. Other topics in environmetrics covered in this book include time series analysis in decision making, estimating missing observations, simulation, the Hurst phenomenon, forecasting experiments and causality. Professionals working in fields overlapping with environmetrics - such as water resources engineers, environmental scientists, hydrologists, geophysicists, geographers, earth scientists and planners - will find this book a valuable resource. 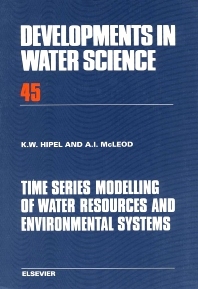 Equally, environmetrics, systems scientists, economists, mechanical engineers, chemical engineers, and management scientists will find the time series methods presented in this book useful.